IF PEACE AND TRANQUILITY ARE WHAT YOU DESIRE LOOK NO FURTHER THAN 738 BODENHORN RD. 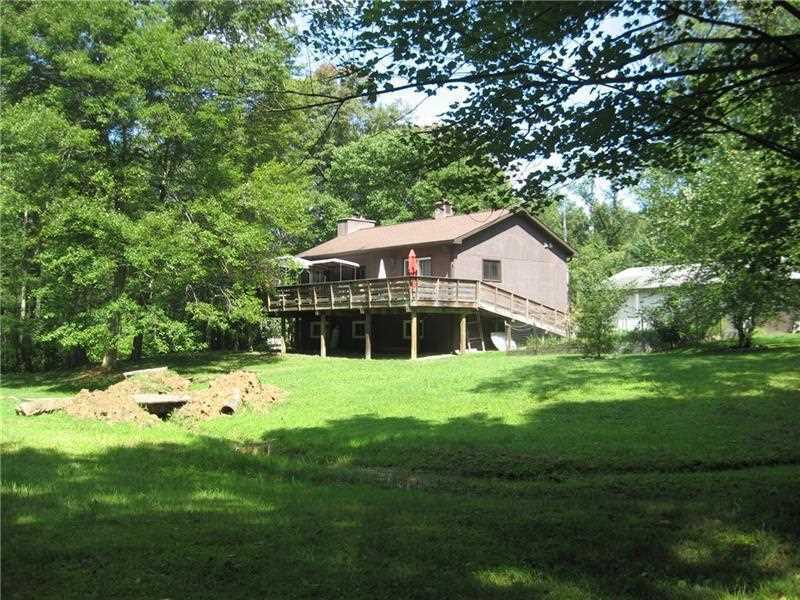 LOCATED A SHORT DRIVE FROM CLARION AND SLIGO THIS PROPERTY GIVES EASY ACCESS TO WATER SPORTS AND STATE GAME LANDS FOR ALL YOUR OUTDOOR ACTIVITIES. THE MAIN LEVEL OF THE HOME FEATURES A NICE SIZE MASTER BEDROOM WITH PATIO DOOR LEADING TO EXPANSIVE DECK OVERLOOKING THE BACKYARD AND A SMALL CREEK. THE MAIN FLOOR ALSO FEATURES OPEN CONCEPT LIVING ROOM WITH BEAUTIFUL STONE WOOD BURNING FIREPLACE, SPA LIKE BATHROOM, BEAUTIFUL KITCHEN WITH HICKORY CABINETRY AND DINING AREA WITH SLIDING DOOR TO THE DECK. THE LOWER LEVEL HAS 2 ADDITIONAL BEDROOMS, FULL BATH, FULL KITCHEN, OPEN CONCEPT FAMILY ROOM WITH WOOD BURNING FIREPLACE, AND LAUNDRY AREA. ON THE PROPERTY YOU WILL FIND A WELL ESTABLISHED RAISED BED HERB GARDEN, PEACH, APPLE, PEAR, HAZELNUT TREES AS WELL AS GRAPEVINES AND BLUEBERRY BUSHES. FOR THE MAN THAT LIKES TO TINKER, THERE ARE TWO DETACHED GARAGES WITH TONS OF WORK SPACE. Directions: ROUTE 80 TO CLARION EXIT TO 68 WEST TO RIGHT ON BODENHORN RD. (AT BIG COW). GO 1.4 MILES TO HOME ON LEFT. I was searching for a Property and found this listing (MLS #1357003). I would like to schedule a showing for 738 Bodenhorn Sligo, PA 16255. Thank you! I was searching for a Property and found this listing (MLS #1357003). Please send me more information regarding 738 Bodenhorn Sligo, PA 16255. Thank you! MLS # 1357003: This property at 738 Bodenhorn, Sligo, PA 16255 is located in the subdivision and is listed for $183,000. MLS # 1357003 has been on the market for 238 days.